You might be wondering why you would need writing services. It can’t be that hard to create some content, right? Just put together a few paragraphs, and voilà! It might not look like it, but writing right is hard work. It involves researching, organizing, writing in a way that is both clear and engaging, editing, and finally, proofreading. A single article will probably take at least 5 hours to do properly, while an epic post of up to 2000 words could take as long as 20 hours—assuming, of course, that you have large blocks of uninterrupted time to focus on only the writing, as it requires sustained effort and concentration. We’re fairly certain that you didn’t get into business to become a writer, or an accountant, or the person who waters the plants at night and sweeps the floor. You got into business because you had a great idea and you found a way to monetize it. That’s a rare gift! Anything that takes you away from the higher-level tasks of organizing, long-term planning, and networking actually harms your business. Because you’re focused on something you could easily outsource, you’re not doing things to advance your business for the long term and you’re probably creating bottlenecks for projects that need your review or approval. There are a number of content marketing blogs that suggest that you should get your whole company involved in producing material for your blog or social media. The idea isn’t completely without merit, as it does allow your customers to see different names and faces on your blog and it will allow you to pump out content at a high rate. But it comes with an astonishing number of hidden costs. First, your staff will probably not be professional writers, so you will end up investing a lot of time (and therefore money) in redrafting, editing, and proofreading the material. Second, by using your staff, you’re effectively paying their hourly rates for content that you could likely get for less by using a professional writing service. This is especially true if you are getting managers or IT staff to write for you, as these positions typically command higher rates of pay. Third, and most importantly, there are the opportunity costs. Time spent on producing content is time not spent doing what you hired those staff to do in the first place. The Internet runs on an up-to-the-minute basis, twenty-four hours a day, seven days a week, which means that your website has to keep up. To ensure that your prospects and customers return to your site, new content must be posted regularly so that visitors do not lose interest. If you’re doing this yourself, you’re committing a chunk of your week—every week; you can’t just publish whenever you get the time, because time has a habit of leaking away. If you’re having staff contribute, you’ll need to have a rota to make sure everyone contributes equally and to keep an eye on it to make sure that less enthusiastic staff pull their weight. You’ll also have to schedule around vacation time, sick leave, conferences, and the big projects, which inevitably start sucking up whole weeks as the deadline approaches. Writing services specialize in producing content on demand for your blog, website, and social media. Reliable services will also guarantee that the content is completed and ready to publish by the deadline. By outsourcing these tasks, you and your employees will be free to focus on sales, marketing, and other key aspects of your business. That way, no time is wasted and a steady stream of content keeps flowing, keeping your readers happy. Writing for the web is significantly different from writing for print. Search engines rank websites based on their content and relevance, and this has a major impact on how much traffic the writing attracts. If the proper keywords and phrases are present, the article can get into the top rankings; but if this is not the case, the writing can be lost forever in a sea of web content. On the flip side, writing strictly for search engines creates awkward, hard-for-humans-to-read prose. Even worse, overdoing it on the keywords can suggest to a search engine that you’re “stuffing” the article in an attempt to game the system, which can earn you a penalty. So, in addition to teaching writing, editing, and proofreading skills to your staff, you will also need to teach them search engine optimization. A writing service will use search engine best practices to make your content more accessible to customers. And by creating up-to-date content on a regular basis, it will make sure that these articles remain relevant to the search engines, which in turn, will bring you more traffic. 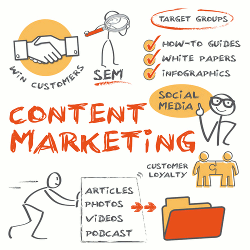 Content marketing is well worth the effort, time, and investment. However, doing it properly can put a huge strain on your in-house resources. As with all business decisions, you should do a thorough analysis of the costs and benefits. Using writing services is one way to get bang for your buck.